Perfect for Valentine's Day! This is the pattern debut class for this quilt! You will receive a free copy of the pattern. 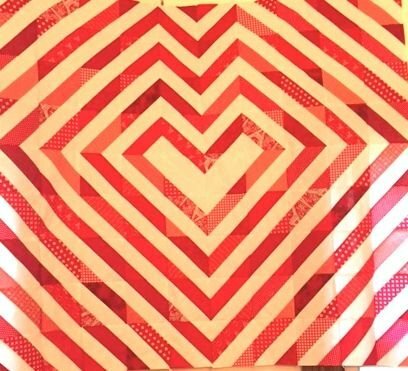 This quilt is made primarily from 2.5" strips and you will use the Creative Grids 90 degree double strip ruler to get this done quickly! Materials Included: free pattern with class! Requirements: Creative Grids 90 degree double strip ruler 2.5" strips of assorted white and red fabrics (25 each) Kits are available for purchase.